Heyco-Flex- Nylon Snap-In" Fittings - US Patent No. 4900068" - Bolt Products Inc.
Home » Liquid Tight Flexible Conduit & Fittings » Heyco-Flex Tubing » Heyco-Flex- Nylon Snap-In" Fittings - US Patent No. 4900068"
Five sizes, 1/4 thru 1", for use with Heyco-Flex Conduit and Tubing. Assembly friendly! The installer simply pushes the conduit or tubing onto the ferrule, then tightens the domed sealing nut. This completed assembly can then be “snapped” into the panel with fingertip pressure. No threading of the conduit or tubing required to install. This eliminates the possibility of cutting the conduit and creating leak paths. Complete conduit/fitting system is reusable. 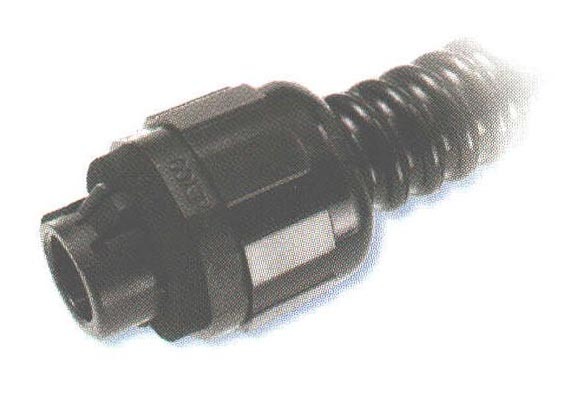 Conduit will not wind tight onto the connector during assembly and can be easily removed by pulling while turning in a clockwise direction. Suitable for indoor/outdoor use; for original equipment manufacturers or field installers. Resists salt water, weak acids, gasoline, alcohol, oil, grease, and common solvents. This feature is not assessed by UL certification or testing. Protection class IP 68 up to 70 psi (5 bar) water pressure.